Model stitched on 28 count Lambswool Linen with DMC floss, Crescent Colours, and Weeks Dye Works. 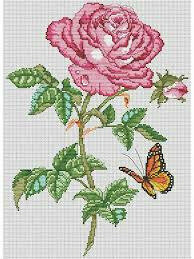 Stitch count: 74W x 103H. 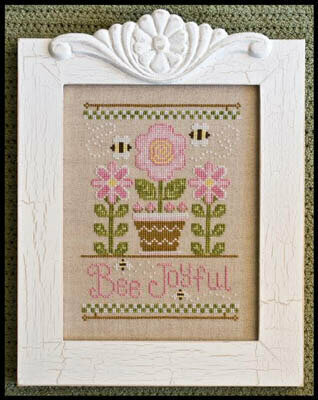 Model stitched on 28 Ct. Jobelan (Antique White, Cameo Peach, or Ivory) with DMC floss. 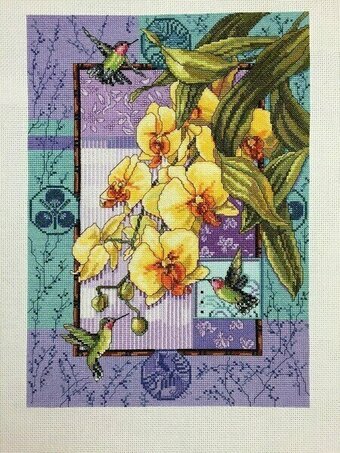 Stitch Count: 125W x 129H. 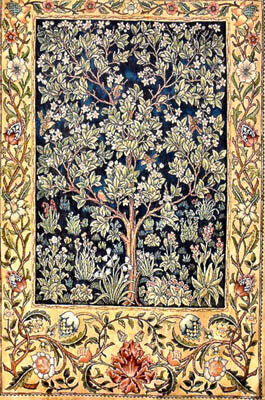 Stitched with DMC floss. 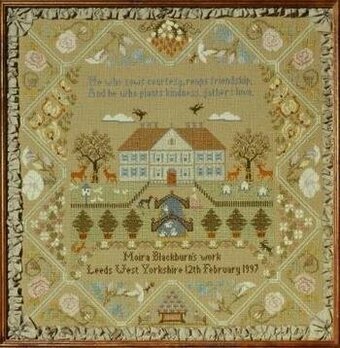 Model stitched on 28 count Lambswool Linen with DMC floss. 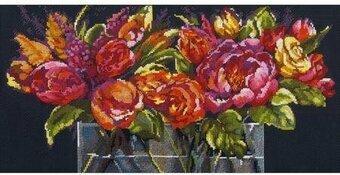 The stitch count is 258W x 258H. 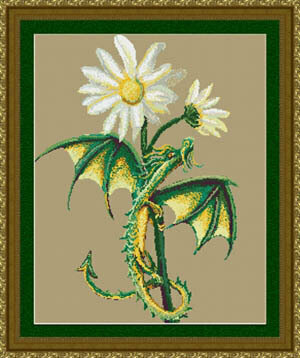 Model stitched on 32ct. 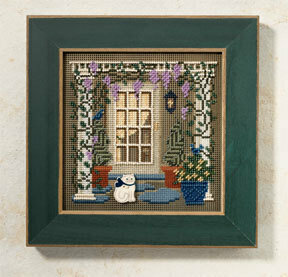 Antique White Jobelan using DMC floss, Kreinik #4 Braid and Mill Hill Beads. 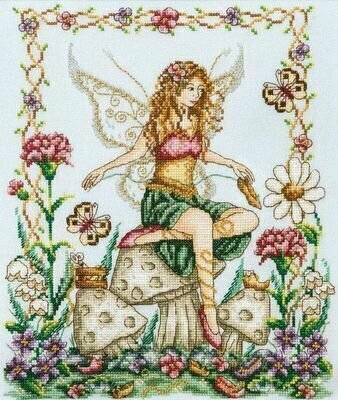 Stitch count: 115w x 154h. 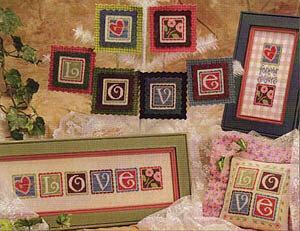 Complete kit includes: Beads, ceramic button,Mocha perforated paper, needles, floss, chart and instructions. 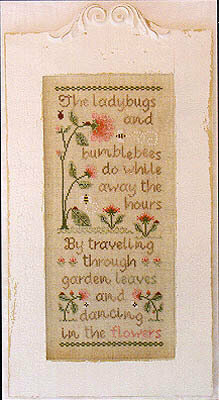 Finished size: 5" x 5"
Stitched on 28 count Natural Raw Linen with DMC floss. 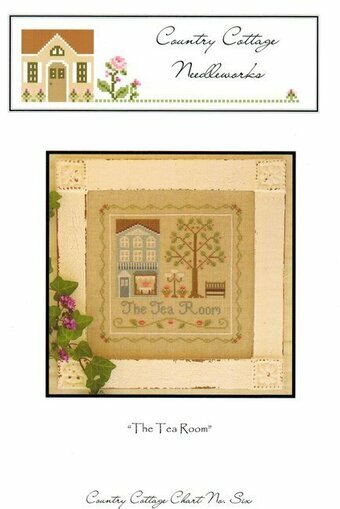 The stitch count is 107W x 107H. 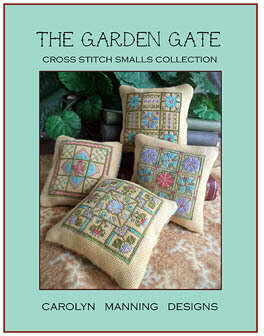 Model stitched on 28 Ct. Cottage Garden linen from Crossed Wing Collection with DMC floss. Stitch Count: 67W x 87H. 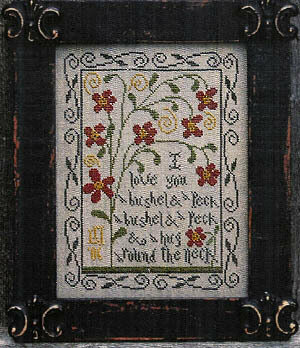 "I love you a bushel and a peck a bushel and a peck and a hug around the neck". 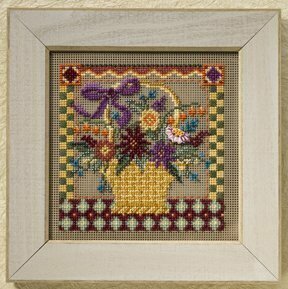 Model stitched on 40 count "3 Stitches Sagebrush" Linen with DMC floss. 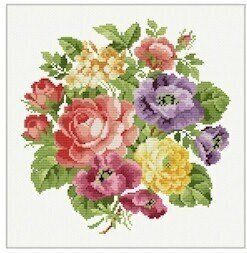 The stitch count is 110W x 147H. 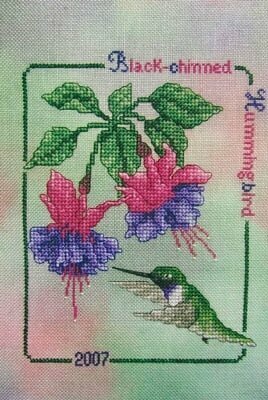 From Crossed Wing's commemorative hummingbird collection. 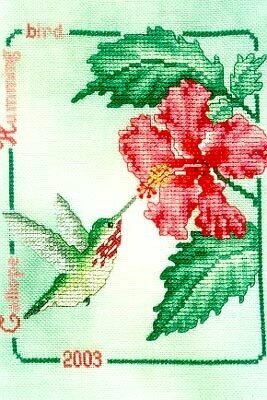 The Calliope is the tiniest of the North American hummers. 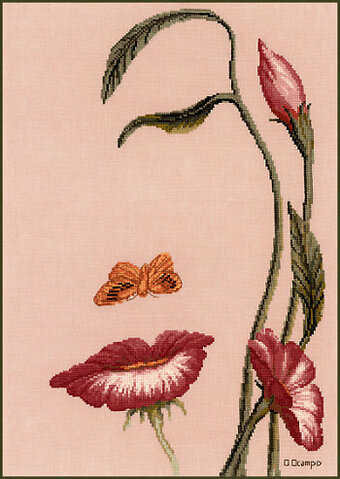 Stitch Count: 69W x 85H. 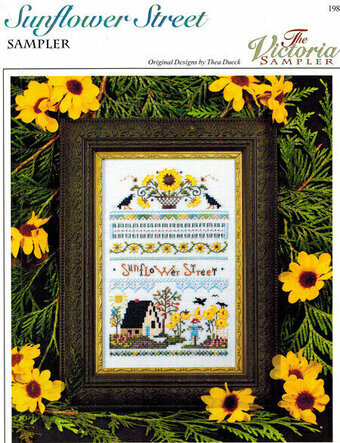 Kit includes 14 Ct. Ivory Aida, color coded thread sorter, needle, and easy instructions. Designed by Tim Coffey. 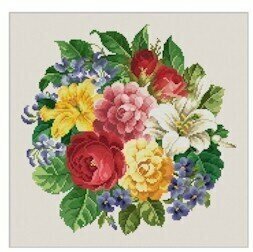 Design Size: 12"x14"
This is a classic and timeless heirloom design. A rosarian tends to her English garden. 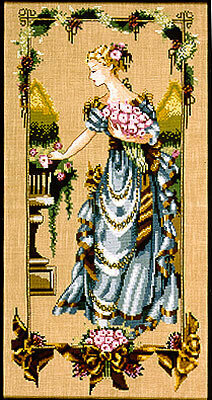 Her dusty blue satin gown is accented with clusters of precious antique beads. 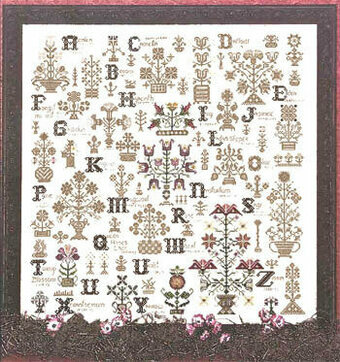 The fairy tale border drips with roses, gems, and lush velvet brown ribbons. It is pure garden romanticism. 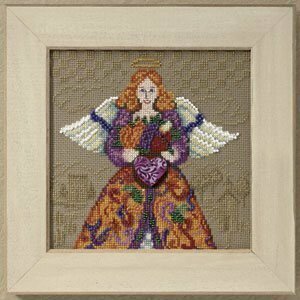 Model stitched on 32ct. Chestnut linen using DMC floss. Stitch count: 131w x 268h. 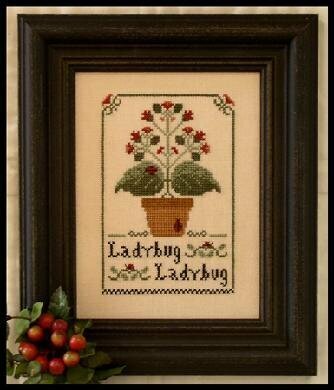 Cute little design featuring adorable ladybugs. 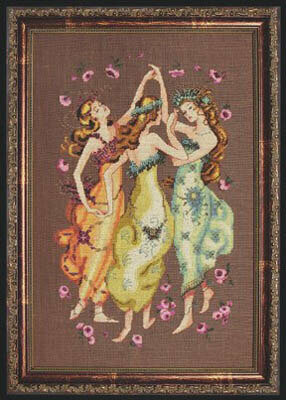 Model stitched on 28 Ct. Light Examplar Linen from Lakeside Linens with DMC floss. Stitch Count: 59W x 87H. 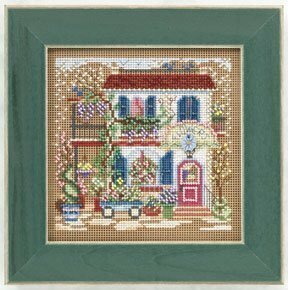 Model stitched on 32ct. 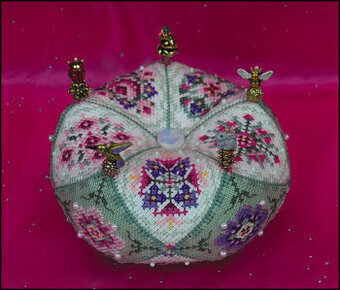 Antique White Jobelan using DMC floss, Kreinik #4 Braid (001HL, 011HL), and Mill Hill beads (02014, 02022, 03049, 42027). Stitch count: 105w x 158h. A striking single rose and rosebud with dew drops still on the petals make a lovely picture by our own Barbara Baatz-Hillman. An eye-catching colorful Monarch butterfly is on the wing to take in the fragrant nectar of the rose. Each chart pack comes with a full color chart with with easy-to-read symbols and graphs. Each chart pack comes with a full color image, chart, DMC floss color guide, and general directions. 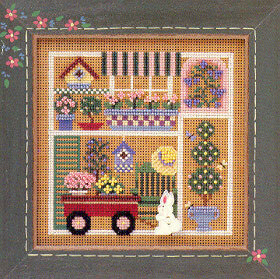 Stitch Count 137w x 190h. Finished Size on 14ct: 9-3/4w X 13-1/2h in. 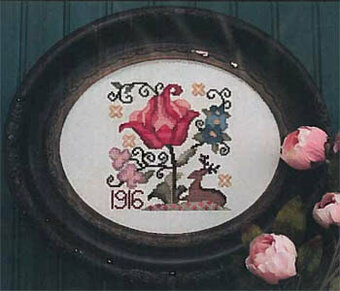 Design by Barbara Baatz Hillman. 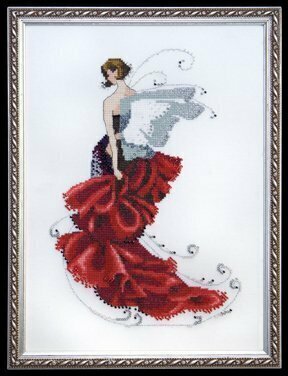 Model stitched on 14 Ct. fabric of your choice with DMC floss, Kreinik #4 and Mill Hill beads. 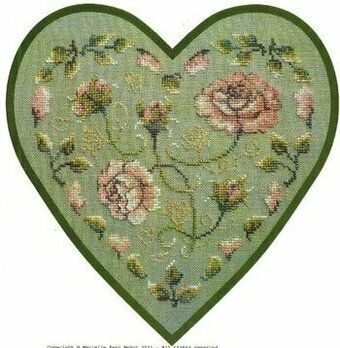 Stitch Count: 131W x 157H. Strawberry Pin Cube model stitched on 32 ct. Pearl Grey. Stitch count: 55 x 55. Quaker Pin Cube model stitched of 32 ct. Antique Ivory. 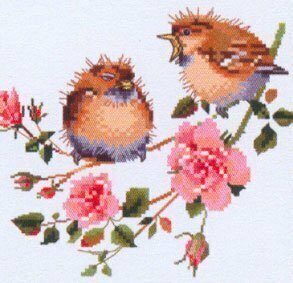 Stitch count: 55 x 55. Both cubes stitched with DMC floss and Gentle Art threads. 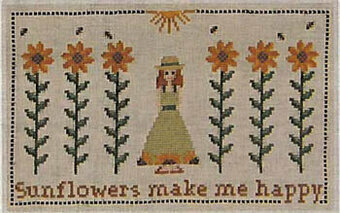 "Sunflowers make me happy" Model stitched on 32 Ct. 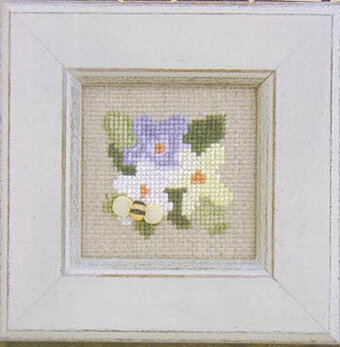 Antique Ivory Belfast linen using DMC floss. 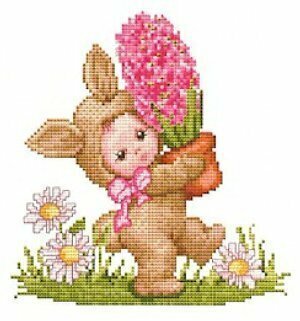 Stitch count is 142W x 85H. 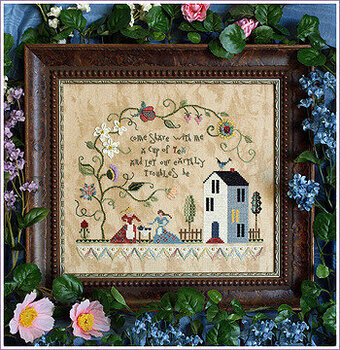 Model stitched on 14 Ct. Sea Foam Hand-dyed Aida from Vintage NeedleArts using Classic Colorworks, and Gentle Art Sampler Threads (or all DMC 3779, 3721, 3802, 356, 938, 729, 937, 3364, 732, 3726, 153, 930, 367, 3031). 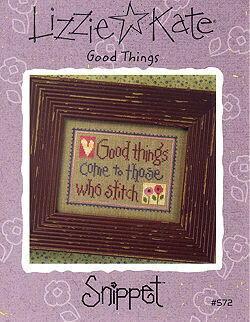 Stitch count is 76W x 80H. 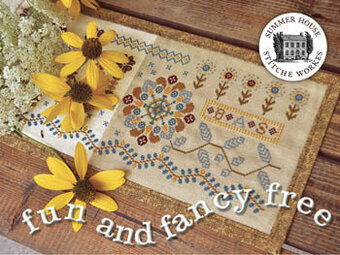 Bring nature's beauty indoors with the aptly named Flowers of Joy from The Gold Collection by Dimensions. 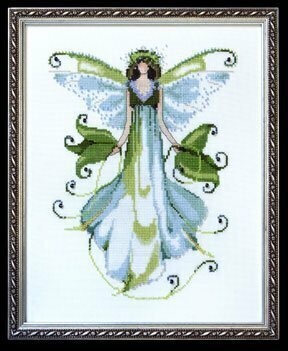 This counted cross stitch design features beautiful details and shading for a stunning display. Finished size: 18" x 9". 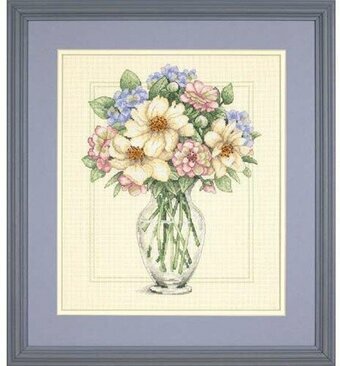 This cross stitch kit contains presorted thread, 14 count black Aida, needles, and instructions. 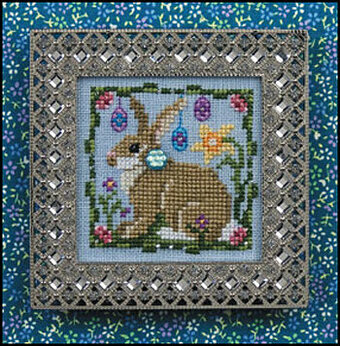 Model stitched on 28 Ct. Ice Blue Cashel linen with Gloriana Silk, Kreinik #4 Braid, Kreinik Silk Mmori, Needlepoint Inc Silk, Treenway silk ribbon, Mill Hill beads, SJ Designs beads, and DMC Pearl Cotton. 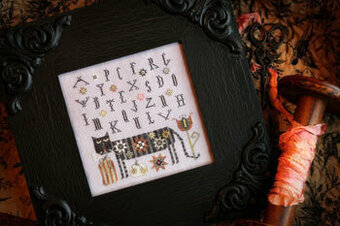 Stitch Count: 64W x 101H. 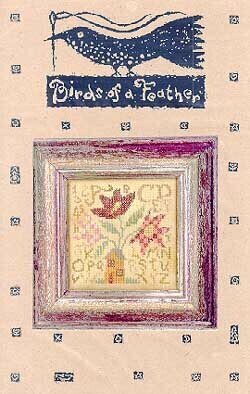 An accessory pack is available containing all of the threads & beads needed to complete the design. 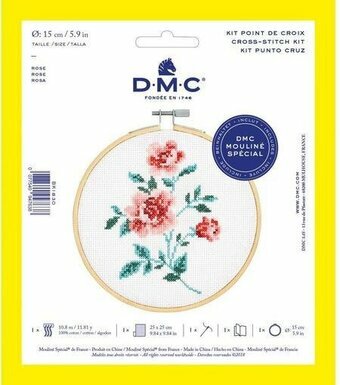 DMC Pearl cotton sold separately. 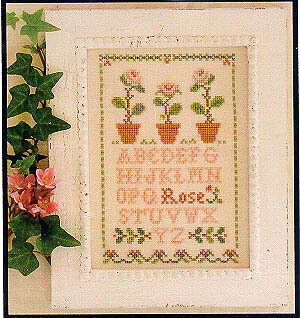 Design uses many specialty stitches - instructions are included.